Jadeja inched up one slot to the third position after claiming six wickets in the Bengaluru. 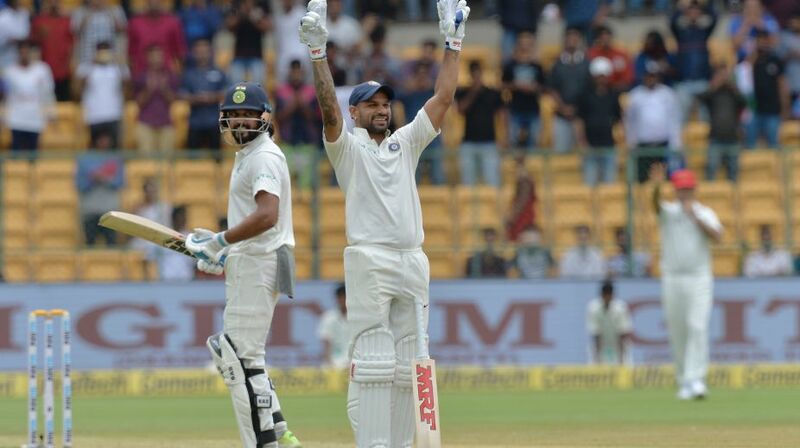 Indian opener Shikhar Dhawan attained career-best International Cricket Council (ICC) Test ranking after his century against Afghanistan in the first session of the visitors’ debut Test match. Murali Vijay, who had also scored a century last week in Bengaluru, moved six spots up to the 23rd position. Dhawan’s knock of 107, during which he became the first player from India to complete a century before lunch on the opening day of a Test match, saw him gain 10 points to reach a career-best 24th position while Vijay’s innings of 105 lifted him six spots to 23rd position as they helped India win the Test within two days by an innings and 262 runs. Meanwhile, spinner Ravindra Jadeja inched up one slot to the third position after claiming six wickets in the Bengaluru Test while fast bowlers Ishant Sharma (up two places to 25th) and Umesh Yadav (up two places to 26th) also made northward movement. Afghanistan players made an entry into the players’ rankings. Hashmatuallah Shahidi (111th) and captain Asghar Stanikzai (136th) are among the batsmen, while Yamin Ahmadzai (94th) and spinners Mujeeb ur Rehman (114th) and Rashid Khan (119th) figure among bowlers. Rashid is currently top-ranked in T20Is and second in ODIs. For Sri Lanka, which trail in the three-match series against the Windies 1-0, captain Dinesh Chandimal has gained one spot to move up to ninth position after his effort of 119 not out and 39 while Kusal Mandis is another batsman to move up, gaining four spots to reach a career-best 12th position.